Local Directions: I-15; exit 276. Go north on 500 East 2 miles to a right on 700 North. Watch for a left into "Beehive and Central Ball Park" at 550 East. Follow paved road (becomes dirt) to Art Dye Park at 573 E. 700 N. 1st tee east of baseball diamonds - 100' east of grassy area in the tailing area. Tees marked with rebar and pink flags. 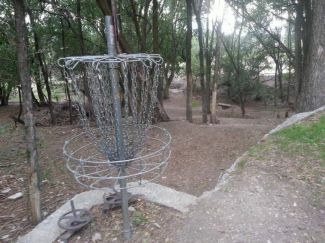 Hole #1 is past soccer fields.